The Highway 99 tunnel schedule has been pushed out again, with Bertha to begin digging this November and traffic to enter in March 2018. Tunnel-boring machine Bertha, whose front end remains in pieces along the downtown waterfront, is to resume digging Nov. 23, according to a new timetable from the construction team. 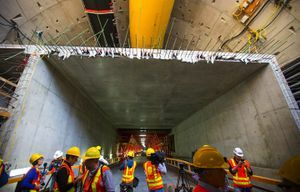 That’s three months after the August goal set by Seattle Tunnel Partners (STP) project manager Chris Dixon, when the drill’s 4 million-pound front end was hoisted to the surface in March. The extra time points to a March 2018 grand opening for traffic to enter the four-lane, tolled Highway 99 tunnel from Sodo to South Lake Union. July 30, 2013: Boring of the 1.8-mile tunnel begins, at the concrete-walled launch pit in Sodo. Estimated tunnel-boring completion: fall 2014. Estimated opening for traffic: late 2015. Dec. 3, 2013: Machine digs 52 feet in a day. Hits steel pipe and stalls three days later. Nov. 8, 2014: Groundwater pumping for a deep repair vault is suspected of causing 1¼-inch ground settlement. Tunnel completion estimate slips to August 2017. March 30, 2015: The 4 million-pound cutterhead is lifted to the surface for repairs. Tunneling expected to resume in August. July 17, 2015: New schedule says tunneling will resume Nov. 23. Workers discovered far more damage than expected as they took apart the tunnel machine this spring. The manufacturer, Hitachi Zosen, has been identifying additional parts to replace, repair or resurface. 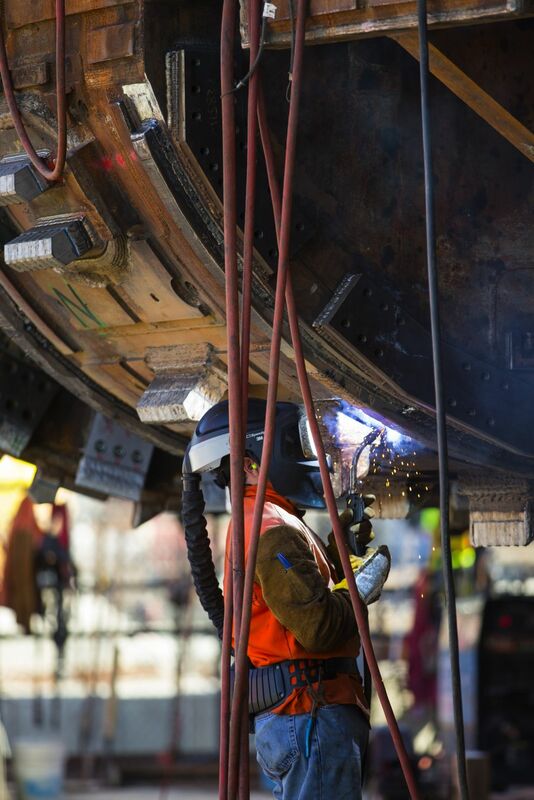 The changes are so extensive Dixon has plugged an additional month of tests into the schedule, after Bertha’s disc-shaped cutter is reattached 120 feet below South Main Street. Bertha overheated and stalled Dec. 6, 2013, and since then has moved only far enough to reach a repair vault. The Washington State Department of Transportation (WSDOT) intends to issue an announcement Friday morning, some 10 days after receiving STP’s update. State officials said they needed time to review more than 250 pages, before divulging details. “There were over 1,000 changes from the previous schedule,” said Todd Trepanier, Highway 99 administrator for WSDOT. Trepanier said the technical plan looks logical, but it’s too early for him to say with confidence whether Bertha will really burrow forward by Nov. 23. Bertha’s cutterhead will spin in open air during October, inside the vault. These tests are meant to simulate Hitachi Zosen’s tests for new machines on the shop floor in Japan. If parts don’t move smoothly, workers can still reach them to make adjustments, he said, before dirt is poured back into the vault for full-pressure tests. “We always said the repairs were going to take as long as they need to take, to be sure they’re done right,” Dixon said. Why were the machine’s outer seals ruined, gear teeth cracked and other parts damaged so badly? Dixon would only say that STP is still investigating. Seattle Tunnel Partners has issued this new timeline, to resume digging the Highway 99 tunnel. August: Lower front end into 120-foot-deep access vault. September: Connect front-end drive parts, hoses, pipes and cables to Bertha’s body. October: Open-air testing inside the vault. November: More testing, with dirt in the vault. Restart Nov. 23. Jan. 19:Stop at a “safe haven” just before the Alaskan Way Viaduct, for four weeks of inspection and adjustment. Late February:Drill under the viaduct, which may be closed seven to 10 days. Nov. 29, 2016: Bertha reaches the finish line, at South Lake Union. June 2017: Road decks, walls and ceilings done, followed by signals, ventilation and testing. March 9, 2018: Tunnel ready for traffic. It is unclear whether STP might try to pass on the additional costs to the state. The $2 billion tunnel is the largest piece of the state’s $3.1 billion program to replace the fragile Alaskan Way Viaduct, while creating space for promenades and city parks — along with rising property values. Before tunnel boring started July 30, 2013, state officials said the tunnel would open by the end of 2015. Restart dates have slipped before. STP initially announced a September 2014 restart, after finding that grit had penetrated a series of rubber seals that protect the rotary main bearing. Then last June, when Hitachi Zosen issued a repair plan, the target became March 2015. But contractors needed months to dig the access vault, a tricky job in which groundwater removal sank a section of the viaduct by 1¼ inches and is suspected of sinking a water line, according to the city. Bertha finally drove forward into the vault Feb. 19, leading Dixon to set the August goal. • Extensive resurfacing was needed so circular parts will rotate smoothly, alongside the new seals. In one case, a steel sleeve was installed to surround a circular surface that was badly gouged. • Hitachi Zosen ordered a full set of 24 pinion gears plus two spares — instead of replacing only a few pinions that WSDOT previously revealed as chipping and cracking. These pinions are turned by 24 high-voltage electric motors. The 24 pinion gears turn the huge bull gear that spins the cutter. • Six spokelike mixing arms, which stir the freshly carved soil before it drops into the conveyors, will not only be lengthened but equipped with small paddles, to more thoroughly mix the muck. • More steel blades were fastened to the 57-foot, 4-inch diameter cutting surface. • A new “center pipe” was ordered, to arrive Saturday, after cracks were found where the old pipe attaches like a hub to rotating parts. • Besides replacing the outer seals, which surround the main bearing, Hitachi Zosen also replaced the inner bearing seals as a precaution. To date, WSDOT says contractors haven’t requested additional state money for this summer’s work. An expert-review panel this spring said STP’s total requests for change orders would likely top $300 million, including a placeholder $125 million STP reported last year, based mostly on project delays. The contract with STP is for $1.35 billion. Disputes about overruns could take years to resolve. Roadwork goes on. Construction teams are building vehicle decks at the portals, and four yellow ventilation stacks were recently fastened to the frame of the Sodo maintenance base.